We love to host large cook outs. It is so much fun to have friends and family over. Since we do our cooking over our fire pit, its very relaxing to sit around the fire with them. No need to stress about having everyone over, here’s how to prepare for a large cookout so I can enjoy the cook out, too. The fun part! If your having a lot of people over, it’s better to stick with tried and true recipes, instead of trying lots of new recipes. To keep things simple, I’m using the same menu for both cook-outs. My family doesn’t care, and the guest list is different for the cook-outs, so the guests won’t know. We’re having: Hamburgers w/ lettuce, tomatoes, onions, Hot Dogs, Brats, Potato Salad, Macaroni Salad, Baked Beans, Carrot Sticks, Watermelon, S’mores. Drinks: Water, Lemonade, Ice Tea. A pretty simple, but crowd pleasing menu. Now it’s time to check your supplies. Are you using real or paper plates, cups, silverware, etc.? Do you have enough? What about napkins, serving trays and the like? Start counting and add needed items to your grocery list. Check your menu against your pantry. This way, you won’t over buy. It will help you keep the cost of your cook-out down, if you shop your pantry first. Make sure you check your condiments, too. You don’t want to run out of ketchup or mustard. I am a huge plan ahead and make ahead fan. Potato salad and macaroni salad actually taste better made the day before. The flavors have plenty of time to mingle. Once you figure out what you want to make ahead, it’s time to make a detailed cooking lists. Place non-refrigerated food items on tables: buns, chips, marshmallows, graham crackers, etc. Bring out refrigerated food, do this right before you eat, so you don’t have to worry about anything going bad. Refrigerate leftovers promptly. If you take the time to plan ahead and make these lists, your cook-out will go smoothly. Enjoy your guests, and the great food you prepared! Love these tips! Thanks so much for sharing! Wow, can I come over for a cook out? You’ve got it all down. I’m not that organized. I enjoyed the tips you give:) Planning by cooking ahead really helps. These are some great tips for a cook-out. I like to plan ahead too. Thanks! Potato and macaroni salad do taste better the next day. I’m looking for a good potato salad recipe. I love it, just not the way I make it. It’s also nice if guests chip in by bringing a side dish, burger buns. Just something to help out. I love cooking outdoors in the fire pit. We take an empty can and put in a potato stuffed with cheese and bacon bits. Of course it’s foil wrapped. Then we just toss it in the fire and let it cook. Note to self, do not read about food when you are starving. Large picnics with family and friends is something we really enjoy. I love all of your great suggestions. These will really help us for future get togethers. These are all excellent suggestions. There’s so much to do before and during. Often, the host is so busy they can’t enjoy themselves. That’s the point of a get together. To relax and have fun. I’d love to have a big cookout, but with both sides of my husband’s family having lakehouses, we will probably never have the chance to host one! We cook out year round, no matter what the weather is like. There’s just something about the taste of food prepared on the grill. It’s better than frying or baking. 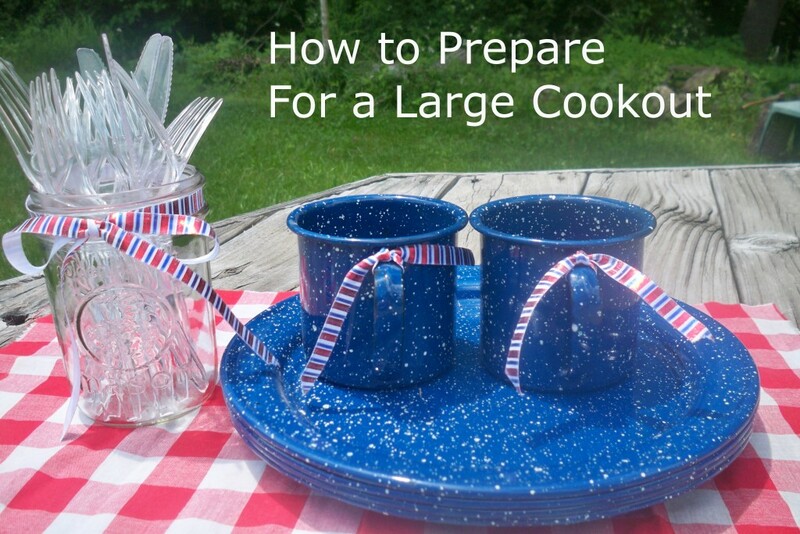 There’s a lot to do when planning a large cookout, this list is very helpful. Thank you for sharing this post. Another thing to remember is to keep the food properly chilled. I recently had food poisoning. I honestly felt like I was going to die, I was so sick. Thanks for all your great tips. You sound very detailed and organized, which is wonderful. I am an event planner, so my brain works the same way. I use and love organized detailed lists. Thanks again for sharing. Hard thinking of a cook out now, it snowing out. But sounds wonderful right now. A cook out is always fun. Once a year they close off the street and have a big block party cookout. hi, i have 5 grown children now, 2 sons-in-law, 1 daughter-in-law, a husband and 3 grandchildren. all of our cookouts are large, what super tips to help me out! Great tips! Especially the Make a Detail Cooking List I usually run into issues with food not coming out at once i think making a cooking list would help me better plan! Just looking at this prep list, makes me want to get a cookout together. Great advice and very helpful especially now that the weather is getting warmer and we are able to eat outside!